This article is 2767 days old. 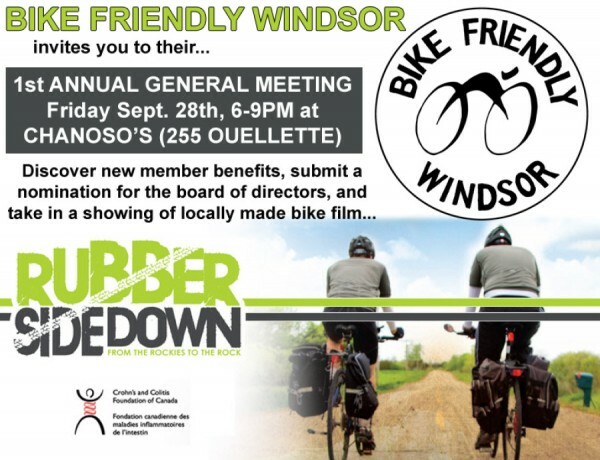 Windsor’s first organized cycling advocacy group, Bike Friendly Windsor is seeking volunteers for its board of directors, hosting their annual general meeting and a screening of Rubber Sidedown, a film on an 8000km bike journey across Canada. BFW is looking for volunteers for its board of directors; if you’re active in interested in promoting cycling in Windsor, nominations may be made by sending an email to [email protected] Bike Friendly Windsor also released details on its membership benefits. Members can join BFW for $10 a year. On Friday September 30th, BFW will be hosting their Annual General Meeting at 6pm at Chanoso’s Restaurant in Downtown Windsor. Screening of Rubber Side Down takes place the same evening at 6:30pm. For more information, take a look at this Facebook event.